When the Iraq war began, conservationist Lawrence Anthony could think of only one thing: the fate of the Baghdad Zoo, located in the city center and caught in the war's crossfire. Once Anthony entered Baghdad he discovered that full-scale combat and uncontrolled looting had killed nearly all the animals of the zoo. But not all of them. U.S. soldiers had taken the time to help care for the remaining animals, and the zoo's staff had returned to work in spite of the constant firefights. Together the Americans and Iraqis had managed to keep alive the animals that had survived the invasion. Babylon's Ark chronicles the zoo's transformation from bombed-out rubble to peaceful park. Along the way, Anthony recounts hair-raising efforts to save a pride of the dictator's lions, close a deplorable black-market zoo, and rescue Saddam's Arabian horses. 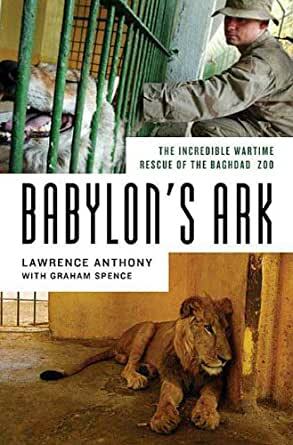 His unique ground-level experience makes Babylon's Ark an uplifting story of both sides working together for the sake of innocent animals caught in the war's crossfire. One of the best animal rescue books I've ever read. The account is of the devastation that took place in Bagdad at Saddam Hussein's famous zoo there, which housed some magnificent wild animals, many who perished there during the early days of the Iraq War. Some very special conservationists, led by a South African, put their lives on the line trying to rebuild the almost demolished zoo, nurse the wounded animals back to health, locate huge amounts of food for these large animals, create a source of watering, and protect those animals who were left there - from poachers and from the consequences of the neglect and wounds these animals received. This is a story of commitment, perseverance, bravery, ingenuity, teamwork, and most of all, a strong love of, and respect for the animals who were being kept at the Bagdad Zoo. Definitely worth the time to read if you have a heart for saving animals. Gives you a new understanding of zoos and the horrors of war on innocent animals. The bravery and determination of these men and woman to save these animals is riveting. The Iraqis who assisted the rescue and their families faced death every day. The help extended by our military to this rescue has gone undocumented and is nothing short of amazing. Mr. Anthony saved Saddam's herd of rare Arabian horses from being exploited and disbursed. I loved this book as I do all Mr. Anthony's books. He truly writes from the heart. His love and dedication to all animals is evident on every page. A well-written account of a usually unseen, unspoken aftermath of war - the devastation inflicted not only on humans, but also animals abandoned during times of conflict. Heroism comes in many forms - e.g., the South African author who is determined to make a difference as well as the Iranian zoo staff who brave snipers and unspeakable conditions to help the zoo animals. Interspersed with the zoo story are historical facts/reminders of the social and political context before, during and after the war. I cannot praise the author enough for bringing this story to our attention and awareness. 5,0 van 5 sterrenInspirational - one of those books that stays with you. Showing one person can change the world - really. It was good to read this after reading the Elephant Whisperer by the same author - then I had an idea of who Lawrence Anthony was as he went into Iraq to Baghdad Zoo. Far out! These two books Elephant Whisperer and Babylon's Ark should be recommended reading for all.Brilliant books!! Deeply moving. Made me think about how I move in this world, too - and what can I do to nourish and save the planet. Lawrence Anthony has proved that regular people can save and nourish our animals and environment by listening carefully and then getting out there and doing it. Inspirational - one of those books that stays with you. Have I said enough? Read it! Read it to your older children Does anyone do that any more? Talk about it with them. There are those of us who wish to change the world, even in a small way, and maybe we make small contributions, but mostly we feel overwhelmed by what we are up against. Then there are those who see the challenges and take them on, determined to REALLY make a change and somehow, figure out how to overcome the obstacles that stand in their way. Martin Luther King, Mother Theresa, Harriet Beecher Stowe are some examples. And there are more. But down in South Africa, there is a man I never heard of until I read his book The Elephant Whisperer, who managed the humble but seemingly impossible task of saving the Baghdad Zoo after the American invasion. His book is a testimony to what a handful of people can do against seemingly impossible odds.